Unfortunately, spiritual darkness grows and so Apprising Ministries continues monitoring the apostasy metastasizing within mainstream evangelicalism for the Christian Research Network. While this is going on I’m watching a sickening syncretism that seems to be spreading through increasing charismania and corrupt Contemplative Spirituality/Mysticism (CSM). Pietism inherent in the CSM of Foster-Willardism is causing people to jettison the proper Christian spirituality of sola Scriptura in place of highly subjective feelings; what we’re calling sola experientia. This kind of stuff is rampant in the Southern Baptist Convention; in fact, the SBC is now so pathetic that Alabama Baptist Convention (SBC) Encourages You To Learn Lectio Divina From Apostate Tony Jones. Now keep in mind a couple of things here 1) this is not a church, it’s an entire state SBC convention. And 2) the paper they point us to was originally done by the Georgia Baptist Convention, which is the SBC convention for that state. As is wont to happen as these things are exposed, the link has been moved. However, I found it. Just click this: Spiritual Disciplines: Pathway to Christian Maturity; and you’ll go right to it. The reason I brought this up is because charismatic big names in the SBC, e.g. like Rick Warren and Beth Moore, have been led by their subjective feelings—allegedly by God—to become protholics. They’re not really Protestant, and not quite Roman Catholic. Unfortunately, all who follow feelings eventually end up there. Beth exposes one potential downfall of those with the gift of discernment. God wants every single one of us to have discernment. But the Word of God also speaks of a gifting. they are important in a body of believers. They’re important in a church. I can’t tell you ah—the, there’s no, um—no estimating the cost if we don’t have somebody operating in that body of believers that have [sic] the gift of discernment. But, the way the gift of discernment—if that happens to be you—where you’re kind of the one, you’re one of the ones that kind of gets a feel for stuff—an, and you’re one of the ones that have some, some influence in your body of believers—or in your household where you got the gift of discernment—one of the ways it twists, and counterfeits, is in a critical spirit. Like all false teaching there is an element of truth; yes, it is absolutely possible for those not called into the mission field of online apologetics and discernment ministry to be overly critical. However, what seems to be obscured is that we learn discernment from God’s Word; we don’t get it from “liver shivers” that make you feel all warm and tingly inside. God’s Word does the judging. In other words—an you, just because it’s been right enough—and I say it, by just talking about the gifting itself—the, then there’s a superiority that goes with it. That there’s something that, um, that psychological that we get from being right. And those are questions we have to answer constantly. A-am I just, i-i, is it discernment; or do I just have a critical spirit? No one who truly has the Biblical gift of discernment acts superior to those we have to criticize. We go to the Lord’s woodshed long before we even open our mouths to say anything at all. I never forget that I have the undeserved privilege of serving God’s people, and but for Hs grace, I also would be as deceived as Beth Moore is. It’s glaringly obvious she does not have the gift of discernment. More hate mail arrives on almost a daily basis. 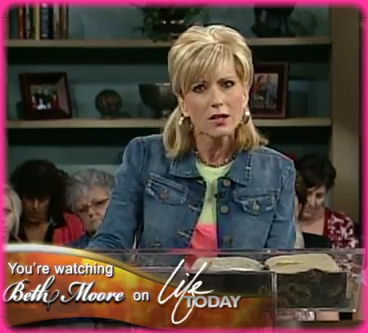 I critiqued Beth Moore on several different counts and encouraged Christians to use discernment (how dare I!) concerning her ministry. And I’ll also suggest to you I am not the only one. And tonight I’m going to do my absolute best to illustrate to you something that God showed me out on that back porch. He put a picture…I’ve explained to you before I am a very visual person…so He speaks to me very often putting a picture in my head. That’s Moore’s testimony; those are her own words. If one is unbiased, the following should now be crystal clear: 1) Beth Moore is talking about the universal Church, i.e. the Body of Christ; 2) she’s also claiming extra-biblical revelation via a literal vision that she testifies God showed her, and 3) it supposedly enabled her to see the Church “as Jesus sees it.” There’s simply no way around this, period. What I’ve done in this particular class that makes this group so special, and I’m loving this about you who are online, we are a very interdenominational group. And so I’ve literally gotten to position people from these denominations and from these backgrounds into these groups. So that just thrills me. So this part we’re not playing. However I’ve just made up the name from familiar names of churches I’ve seen through the years. Right over here to my right you see First United Methodist Church of Lessthanland. Right behind them you would find just down the street, just across the street really, you’ve got Christ the Redeemer Lutheran Church. Every single one of my sisters in this area attends a Lutheran church which thrills me. These all attend a Methodist church. I can’t tell you how I love that kind of diversity. What I’ve asked these ladies to do right here, now this makes it a little bit different, because they do go to different churches. But what I’ve asked them to represent to us tonight to us is an African-American church that we’re going to call Mt. Zion Missionary Baptist Church. Is that good? Did I do good? Yes! Hallelujah, Hallelujah! Right back here I want you to meet St. Anne’s [Roman] Catholic Church of Lessthanland. These ladies come, every single one of them, although they don’t go to one [Roman] Catholic church, every single one of them attend a [Roman] Catholic church probably right here in Houston. And I am so thrilled that they are here. What I’ve asked my sisters to do here, actually they represent many different churches but they represent one church in our midst tonight. These are our sisters that attend different Charismatic churches in our city but tonight they attend Abundant Life Church. Is that good? The Roman Catholic Church condemned the Gospel of Jesus Christ; this was at the very heart of the Protestant Reformation. So we have to ask: Does SBC Bible teacher not know this? And we also need to ask: Why does Lifeway, publishing arm of the SBC, promote Beth Moore’s heretical view on its website?